For Pakistan's Shi'ites, the horrific scenes were depressingly familiar. On Tuesday, as thousands of Shi'ite worshippers solemnly shuffled through the medieval and narrow streets of Lahore's Old City, past its historic displays of Mughal grandeur, a teenage suicide bomber blew himself up nearby at a police checkpoint, killing 13 people and wounding scores. An hour later, in Karachi, a bomb exploded near a second procession, slaying two policemen. 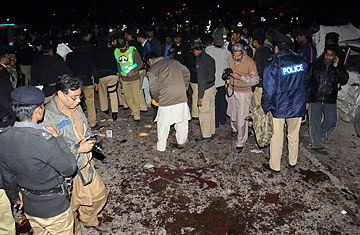 "It's very tragic," Shah Mahmood Qureshi, Pakistan's Foreign Minister, tells TIME. "One can only despise the elements who are killing innocent people, people who are performing their religious duties." The marchers were marking the final day of an annual Shi'ite mourning period that recalls the 7th century martyrdom of their most revered saint, Imam Hussain. Most traditional days of mourning are now followed by fresh ones. Last September, as Shi'ites marched through Lahore's same streets to mark the day of Ali, the Prophet's cousin, a triple suicide bombing ripped through the city, killing 31 worshippers and wounding more than 200. And just two days later, terror struck again, with over 43 Shi'ites slain in the southwest city of Quetta amid an annual march in support of Palestinians. A year ago, 32 people were brutally killed in Karachi on Ashura, the holiest day for Shi'ites, who are a minority in predominantly Sunni Pakistan. "Sadly, you can predict a terror attack on any of these days and you won't be wrong," says Talat Masood, a retired general turned security analyst. "We don't want sectarian strife," says Qureshi. "Shi'as and Sunnis have lived together for centuries in harmony." The processions are a centuries-old affair that have traditionally enjoyed the support of the local Sufi-leaning Sunni population. But the sad reality is that in a country founded by a Shi'ite, Mohammed Ali Jinnah, and previously led by two Shi'ite Prime Ministers, members of the community feel increasingly under siege. Over a quarter of Pakistan's population is thought to be Shi'ite, making it the second largest home for the community after Iran. But in the holy month of Muharram that has just passed, many community members have been reluctant to join processions. They have held their majalis, or gatherings for mourning, in much smaller numbers. Some Shi'ite politicians say they feel the need to keep their faith a secret. The Lahore bombing would have claimed more lives had the attacker managed to pierce a security cordon. The teenage boy, the latest in a series of child suicide bombers, was stopped by police before he could get to larger crowds. The grim news is that there are many more like him out there. "There are thousands of boys who are ready to become suicide bombers. They just need a nudge," warns Sharmeen Obaid-Chinoy, an Emmy-winning filmmaker who has spent years studying the phenomenon. For the militants, children are easy to recruit and train, highly susceptible to brainwashing and usually stand a better chance at evading security measures. "Most of the children I've encountered are madrasah students," she adds, referring to traditional Islamic schools. "They get recruited there and are then sent for training." For many poor families, the madrasahs  which mainly teach pupils to read and memorize the Koran  continue to be a convenient and free education option. There are several stages involved. "First, the children are isolated," says Obaid-Chinoy. "There is no communication allowed with their families, and they are not allowed to watch television or read anything." Older boys then appear, who motivate them with speeches on the virtues of jihad. The next step is to subject them to hours of propaganda videos, alleging atrocities against Muslims at the hands of the Pakistan and U.S. armies. "That's the turning point," Obaid-Chinoy says. The training is not just taking place in the wilds of the northwest, but also in Pakistan's heartlands. The militants' anti-Shi'ite attacks are part of their broadening assault on all religious communities they deem to be heretics or apostates. In recent years, they have attacked Christians, Sikhs, members of the Ahmadi Muslim sect and even the Barelvi Sunni sect, whose adherents form the majority of Pakistani Muslims. "They want to deny space to anyone who doesn't follow the brand of Islam they are propagating," laments analyst Masood. Anti-Shi'ite violence goes back to the 1980s, when the dictatorship of General Mohammed Zia ul-Haq  with Saudi funding  backed sectarian groups with the aim of countering Iranian influence in the region. Many suspect that funding continues. "I would not be surprised if Saudi individuals, if not the state itself, still fund groups like the Sipah-e-Sahaba and Lashkar-e-Jhangvi," adds Masood, referring to groups that began life as anti-Shi'ite but have since attacked other minorities. When al-Qaeda arrived in Pakistan in late 2001, these groups were natural allies, sharing their sectarian agenda. "They had a network spread throughout the country for al-Qaeda to use," says Amir Rana, director of the Pak Institute for Peace Studies. Over time, those links have deepened, reviving sectarian attacks that had diminished in the late 1990s. Senior military officers report that when Pakistani soldiers were held hostage and executed by the Pakistani Taliban and their allies, the Shi'ites would be the first picked out. Many analysts now consider Lashkar-e-Jhangvi  the even more vicious offshoot of the Punjabi group Sipah-e-Sahaba  to be the most dangerous group operating in Pakistan today. It is headquartered in North Waziristan, the one tribal area along the Afghan border that remains untouched by Pakistani military offensives. And it has cells seeded throughout the country, where they routinely menace Shi'ite communities. Such attacks have traumatized the Shi'ites living in Parachinar near the Afghan border, Hangu and Dera Ismail Khan in the northwest, Quetta in Baluchistan, Jhang in Punjab and Gilgit in the northern hills. "The communities there feel they are not being given ample protection by the government," says Marvi Memon, an opposition lawmaker who regularly visits Shi'ite communities there. "They also say that the government hasn't been able to take action against banned terrorist groups. In fact, we are seeing compromises with these terrorists." Such compromises were on display last year, when the Punjab Law Minister Rana Sanaullah Khan courted votes alongside the leader of the Sipah-e-Sahaba, a banned anti-Shi'ite group that has resurfaced under a new name. "We hope the Punjab government is looking at the problem also," says Foreign Minister Qureshi. "They need to focus more closely on the extremist groups there." The child suicide bombers are also increasingly being recruited from the south of the province. "Most of the students I saw were from the northwest, but many are now Seraiki-speaking as well," says filmmaker Obaid-Chinoy. Seraiki is the language predominant in southern Punjab.